As promised the outdoor classroom was built on Friday. It contains one large desk, benches for pupils to sit on, a black board for the teacher to write on and a Bug B&B. One thing we didn't expect to be included was a Bird House. It has been put on the window above Ms Holmes's classroom window. Inside in the bird house is a camera that will record footage of the birds inside. Once again we are very thankful to Kildare County Council for giving us the Outdoor Classroom and we look forward to using it in the future. We really love our new classroom and can't wait to start learning about the Great Outdoors...outdoors! 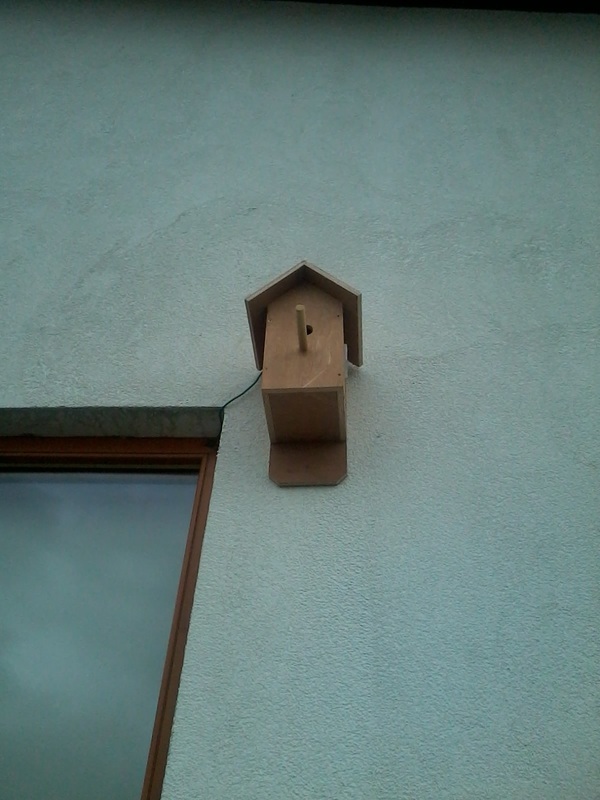 Wouldn't it be brilliant if birds nested in our box and we got see eggs being laid and chicks hatching? I'm keeping my fingers crossed and feeling lucky. I am a project manager in Des Moines, Iowa, USA working with a group of volunteers that wants to build an outdoor classroom at a local elementary school. We love your table and benches! Do you have more information on dimensions that I can share with some volunteers who are willing to build something similar? Thanks!